Princess Yacht Charter is delighted to announce that the Princess 30M Superyacht, ‘Kohuba’ is now available for Charter – a stunning addition to our extensive fleet. ‘Kohuba’ is the very first Princess 30M. This beautiful yacht was built in 2015 at the Princess superyacht facility in South Yard, Plymouth, and she is the epitomy of the Princess M Class range – elegant yet contemporary. She has an expansive interior providing light and space, while her full beam master stateroom offers stunning views of the most breathtaking surroundings. The stateroom is bathed in natural light, pouring in through wide sweeping windows and skylight. The flybridge is equally vast, offering a range of sun loungers, sofas, dining area, a wet bar and spa bath so that guests can relax. The handcrafted finish is exquisite, and guests are spoilt with a choice of three or four beautifully appointed en-suite cabins to choose from. A generous en-suite complements the master with a walk-in shower, twin sinks and granite or marble finish. 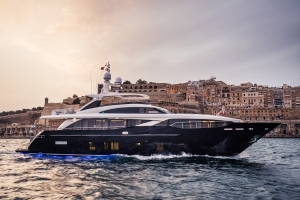 ‘Kohuba’ is now available for Charter in the French Riviera, Corsica and Sardinia.